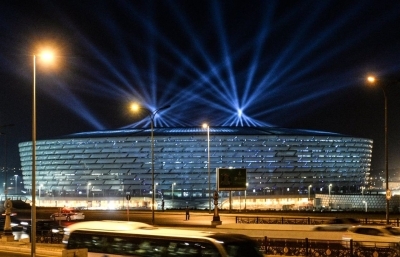 Baku National Stadium is a 68,700-seat stadium, designed and constructed to meet the international standards for stadiums set by the Union of European Football Associations (UEFA), the International Federation of Association Football (FIFA) and the International Association of Athletics Federations (IAAF).Construction of the 225,000-square-meter stadium on a 650,000-square-meter site was completed in February 2015. The six-story, 65.7 meter structure near Boyukshor Lake, Baku, Azerbaijan, opened on 6 March 2015. The main tenant of the stadium is Azerbaijan's national football team, who moved from their previous home at the Tofiq Bahramov Stadium. In June 2015 the stadium served as the main venue for the European Games, hosting the opening and closing ceremonies, and the athletic games. The venue is intended to host the quarterfinals and three of the group games for Euro 2020. A green area is being developed around the stadium, which is accessible via public transport. Main Tenant : Azerbaijan national football team. Map showing the location of Baku Olympic Stadium in Azerbaijan. You have the ability to request en edit to any of the details of Baku Olympic Stadium. You can do this by clicking on one of the options below.